Y’all know that Peckham isn’t really in the Middle East, right? But for our purposes it may as well be, as it is from there that so much of my vegetable lore has been sourced. A lot of it from our pet greengrocer, who never ceases to surprise us with his range of weird and whacky vegetables. Cho cho goes under many aliases. When we first met him he was masquerading as a rather sad, tasteless side dish in Barbados. As the man and I were on our honeymoon however, and the moon was as full as our glasses, and our table was on the beach, and I was wearing that skirt that I’d waited forever to wear, we barely noticed our vegetable accompaniments. As erstwhile gourmands we did think to ask our waiter about it, and discovered that in that part of the world it is called a christophine. 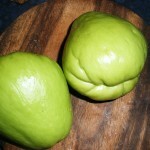 Cho cho is also known as chayote, vegetable pear and choko. When I saw it in the greengrocers the other day I couldn’t resist having a go at preparing it, kind of figuring that in the worst case scenario one’s best beloved would simply spit it out and scowl. So here you go: one vegetable, prepared 2 + 1/2 different ways…. It is most commonly boiled, quite often in the context of soup, and so that is what I did with the first one. In fact the two Jamaicans who were in the greengrocers at the time I was buying my cho chos solemnly informed my that I ‘HAD to boil them and eat them with beef’. 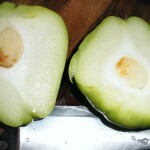 It tastes a little like boiled cucumber or marrow, although as long as you don’t over cook it (it needs about 8 minutes) it has a much better texture. To make it slightly more flavoursome I then tossed it (still hot) in sekanjabin (Persian mint sherbert) and fresh mint and freshly squeezed lime: you could improvise with mint sauce if you don’t live too near an Iranian corner shop. Cho cho must be a cold food (sard) under the Persian system of dietetics, and so the mint (which is garm, or warm) offsets it nicely, whilst enhancing the slight sweetness of the vegetable. Frankly it was delicious and even one’s extraordinarily pernickety in-laws tucked in. This ‘recipe’ would also work well with marrow. The second one we cut into semi circular slices and fried in olive oil. Once it started to soften a tad, we lobbed in 2-3 cloves of diced garlic, 1/2 teaspoon ground coriander, 1/2 teaspoon ground cumin, a pinch of chilli flakes and 1/4 teaspoon ground turmeric. When it started to brown we added 2-3 tomatoes, similarly sliced, and then we covered the pan, turned off the heat and let the cho cho just sit there stewing a while. Know what? It was even deliciouser than the first ‘recipe’. We ate it with forks and moppy bread straight from the pan. One’s best-beloved didn’t scowl. This way of preparing it, for those of you who do not have the fortune of living in Peckham, would also work well with courgette or aubergine. Oh, and the 1/2 recipe to which I referred above? Cho cho is also real nice raw – it makes for fairly fun crudites, holds its own in a salad, and lends pleasing crunchiness in sarnies…. 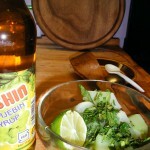 This entry was posted in Postcards from Veggiestan, Recipes and tagged chayote, Cho Cho, christophine, Peckhamistan. Bookmark the permalink. Thanks I will try your second recipe. 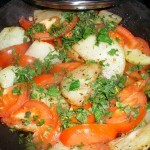 I am preparing a meal to accompany an African play reading. Mmm, I tried the second recipe for lunch today, and served it in a wholemeal pitta. It was delicious and smelled amazing too!